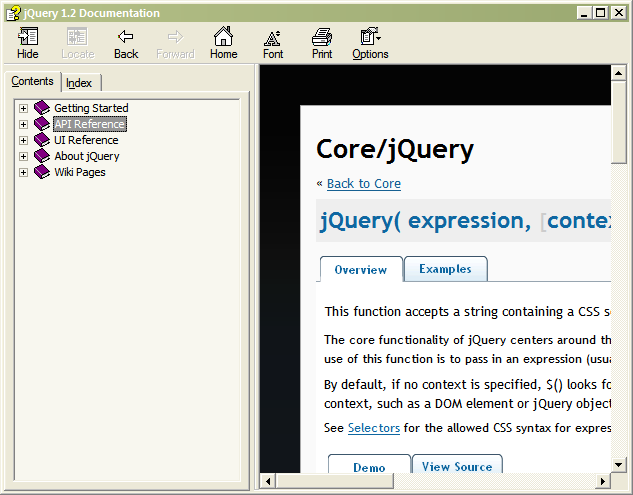 jQuery documentation in chm format. jQuery dan jQuery UI API Reference jquery-api_080906.chm (182,589 B). The source is docs.jquery.com converted into XML format using createjQueryXMLDocs.py by David Serduke, then processed into HTML. docs.jquery.com as of Sept 03, 2008 packaged as chm file. Unfortunately the new site design does not work very well with IE7 so I have to remove the header and footer part and un-float the content. jQuery-docs-win_080903.chm (3 MB), recompressed chm file, smaller but will not work with Linux/Mac viewer. 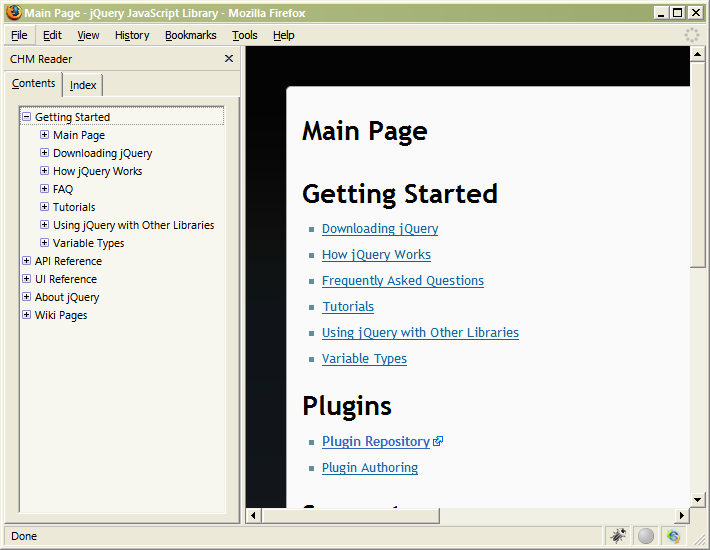 jQuery-docs_080903.chm (5 MB), normal chm file, use Firefox with CHM Reader add-on to open it in Linux/Mac. are you still working for the chm version? I have uploaded the version with jQuery UI above. thanks man, I have told my Chinese friends about this cool chm! Hi guy, this Version is good, a bocket about jQuery. jQuery is become greater than Prototype. Since when did anger can solve a problem ;), what anger do is spreading the problem. Thanks guy.. for this CHM.. you’re great!! I’m already new about this jsquery.. hope this CHM can help me.. thanks again!! it’s me again. after downloading all the .chm above, i can not open the page. but the TOC appears.. something wrong ? in the previous version, it works fine.. (maybe before you update it)..
CHMs downloaded from the internet are blocked by default on XP SP2. You’ll need to right click on it then choose unblock if the option is available. Otherwise try to copy the file to another drive. It’s not about downloading problem.. I’ve download it, and when I open it, the page aren’t exists. So, when I try to click one of the menu in the Content tab, I don’t have the page about the menu that I’ve clicked. “The address is not valid”. I’m using vista here.. any problem with that? since the old version of it, works fine. (also, all the new .chm files after you’ve update it, seems can not be open clearly after I’ve successfully download it). Had problems on Vista with opening the chm. It said “Navigation to the web page cancelled” and I see that others above have problems with this too. 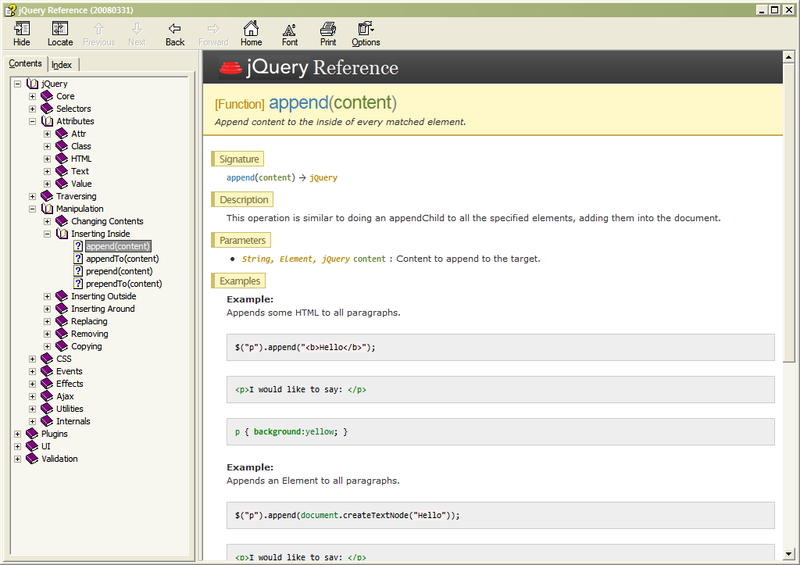 Hi, in my site (http://www.abspace.it/ComputerSpace/JQueryCheatSheet.asp) I have put another version of jQuery documentation. for vista users, you need to right click on the document and then click on property and you will see unblock button below, next to the advanced button, just click unblock and click apply and ok. your CHM will start working properly now. :) you can come on my blog and ask for help, incase if it was still giving problem. This is so useful to me. I always want a fast access to the API references. Thank you. I like to have help manual of any technology that i am working with. I was missing out on jQuery and you filled the void. Thanks again. I’m using Windows vista and this documentation doesn’t show any text, just navigation. I tried to set it to Read mode, but no sucess! Please enable searching in CHM document. It is disabled! All the methods can be found in the index tab, why would you need searching for? Adding search function will increase the size for about 30% and in my experience, the search function in chm is not really useful, it doesn’t sort the result by relevance, more like grepping to me. it is nice to have such a helpful job. it is really nice that programmers are helping one another online. ой, жаксы ))) thanks to you ) аллилуя братья! Hi, gr8 work. Many thanks. The problem is that the content is mixed between text and html format, i.e. sometimes the content is text and sometimes it is html. So, taking the easier (and verbose) way, I just take them all as text, and I think it is still readable. Oh man thx for this nice chm :D good work! There is written that opening that page is cancelled, “try following: re-enter address”. The same page is for all links from TOC and index page (which is shown when file is opened). What’s wrong? (I have IE8). Thanks for your efforts. I tried but could not download the file from box.net due to security issues and they showed a message to contact the file owner. Kindly look into this issue. Finally, I can have access to the manual without going online every time.. When trying to implement this in Adobe AIR i get following error message! wow, what a wonderful work! it really helps me. Thanks for the chm. would you please tell me how to convert that api docs site to chm files? but i have a problem with it, i have downloaded the lastest version jquery-api-20090115.chm but there is no content shown up with me only ..
can u please help me on this one ?? the webpage can’t display always. I can see it now. it blocked by Windows security settings. Thanks. I don’t know what’s going on, but it seems that i can’t download from mediafire! Can you please provide a mirror link? Great job! I check periodically for updates. Very useful indeed. Thank you for this great man, man. The main page says that it was updated in ’07, but fortunately that’s not true. Hope you’ll fix this soon. A very useful resource indeed! May I ask for a box.net download link? (like the previous ones. why the switch to mediafire anyway?) mediafire is blocked on our LAN. Thanks in advance! Wow, thank you for this resource! This is great – many thanks for compiling it! On Win7 x64 it’s necessary to delete all non-alphanumeric characters from the CHM file path, such as ‘-‘ etc, in order to open it successfully. 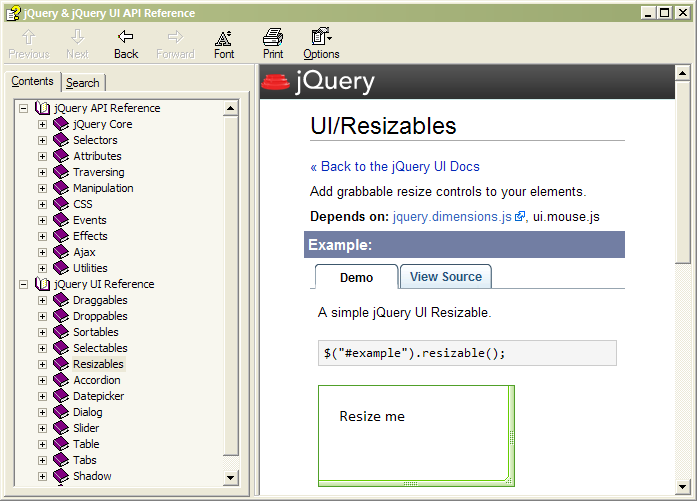 Hi.. thx friend.. you’re awesome..
Can you please also include in the latest Jquery .chm help/resource the jquery ui plug-ins? Great help man thank you.but still need of wordpress chm like this i hope it will big help for every one. Its Pleasure to understand your blog.The more than posts is fairly extraordinary, and I incredibly enjoyed reading your blog and elements that you expressed. I quite like to appear back on the typical basis,post a lot more within the topic.Thanks for sharing…keep writing!!! what you are saying How much time do you spend updating this blog every day? I don’t know if my comment is going to pop up because I’m not very tech savvy, hopefully I can get this right! in this article. A little bit in a hurry, didn’t get to read everything but will definitely come back later to finish everything. You make a very valid point right at the beginning there. Very effectively written information. Will probably be helpful to anyone who usess it, together with myself. Sustain the nice work – for sure i will check out more posts. I’ve recently began a blog, the data you present on this site has helped me tremendously. Thank you for all of your time & work. Many thanks for posting this, It?s just what I was researching for on bing. I?d loads comparatively hear opinions from an individual, slightly than an organization internet page, that?s why I like blogs so significantly. Many thanks! I’m still learning from you, but I’m enhancing myself. I actually love studying the whole lot that’s written in your blog.Keep the stories coming. I cherished it! Please keep adding articles like this one, i always lear something from your post, tx the lord for Jquery!!! Trackback from : Beastman aka SAG Portfolio » Документация в формате CHM и PDF. Trackback from : Quieres aprender a desarrollar un sitio web? Trackback from : Tarinbot! / 23 Cursos y Manuales gratuitos en español para Desarrollado – Taringa!